The essential guide to new and classic science fiction, fantasy and horror. Packed with exclusive behind-the-scenes features, on-set reports, A-list interviews and more, the award-winning SciFiNow is your ultimate monthly guide to science-fiction and fantasy. 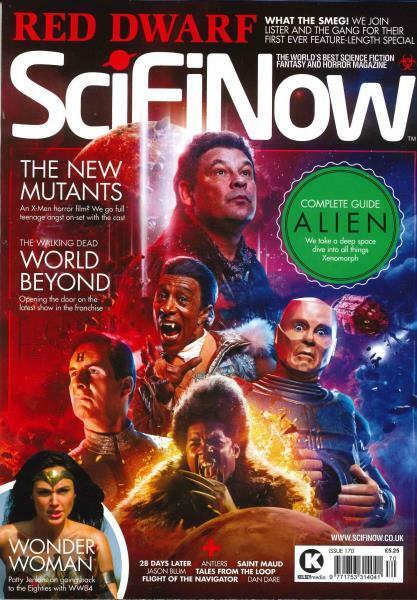 Every issue also includes a unique retro sci-fi section dedicated to the best – and sometimes worst – films and shows of sci-fi past as well as a section devoted entirely to the very best in SF literature, making SciFiNow the best choice for anyone who’s ever wanted to wield a lightsaber. The perfect companion for anyone that loves science fiction - packed full of world-beating access to the very best SF and fantasy shows and movies, giving readers an unrivalled gateway to the leading stars and creators. Superhero Movies: The geekiest ever coverage of the coolest new films, with interviews with the cast and crew to access all areas on-set exclusives. Must-See TV: Whet your appetite for the new TV season with no-holds-barred previews of the hottest new shows and the returning faves. Cult Cinema: Uncover the indie gems getting buzz from the festivals and snubbed by the mainstream. Time Warp: Re-live the glory days of cult TV and cinema, from Kirk and Khan, to Buffy and Buck, with our fan-favourite retro section. Book Club: Discover your next read and rediscover classic authors with the only dedicated SFF section on the newsstand. Boardgames and Collectibles: Grow your wishlist with a look at the latest boardgames and collectible card games, action figures and memorabilia.